On-Board Hose Reel & Integrated Hose Guide - Storing & recoiling the high pressure hose has never been easier. Plug & Clean Detergent System - Quick & easy application of detergent through the pressure washer when your vario lance is set to detergent application mode. 1 m, retractable for optimal storage and stability foot incl. 2nd carrier handle, 8m high-pressure hose on hose reel. Hose guidance through unit: better handling and increased stability. Maximum pressure (bar): 145 bar. Detergent application via, Suction. Quick Connect on machine. High-pressure gun, StandardQuick Connect. Pressure (bar/MPa) 20 - max. 145 / 2 - max. water feed temperature (°C) up to 40. Area performance (m²/h) 40. Quick and easy application of detergents through the pressure washer, when in detergent mode. Quick Connect on machine. There's also an 10m high pressure hose to give you plenty of reach, and a state-of-the-art long-life water-cooled motor that gives extra durability and outstanding performance, backed by the Kärcher 6 year warranty. With buttons for pressure regulation and detergent dosing. The spray type is set simply by turning the 3-in-1 Multi Jet spray lance. During brief interruptions in cleaning, you can simply park the trigger gun and spray lance. Quick and easy application of detergents through the pressure washer, when in detergent mode. Quick Connect on machine. Pressure (bar/MPa)20-145/2-14.5. Water feed temperature (°C)40. Technical Data. The state-of-the-art water-cooled motor gives extra durability and outstanding performance, backed by a Kärcher 5 year warranty. Pressure Washers. Pressure (bar/MPa). water feed temperature (°C). Quick Connect on machine. K7 Premium. There's also an 10m high pressure hose to give you plenty of reach, and a state-of-the-art long-life water-cooled motor that gives extra durability and outstanding performance, backed by the Krcher 6 year warranty. Karcher K7 Premium Full Control Plus Home Pressure Washer 180 Bar. 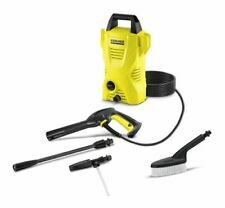 4.5 out of 5 stars - Karcher K7 Premium Full Control Plus Home Pressure Washer 180 Bar. 5 product ratings5 product ratings - Karcher K7 Premium Full Control Plus Home Pressure Washer 180 Bar. 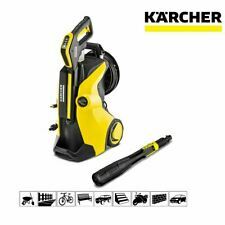 Karcher K7 Premium Full Control Plus complete with T450 with £50 cashback NEW!!! T450 Patio Cleaner. There's also an 10m high pressure hose to give you plenty of reach, and a state-of-the-art long-life water-cooled motor that gives extra durability and outstanding performance. Chemical Plug and Clean Facility. 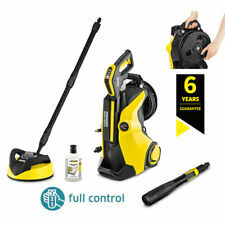 4.5 out of 5 stars - Karcher K7 Premium Full Control Plus complete with T450 with £50 cashback NEW!!! 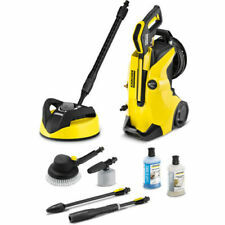 5 product ratings5 product ratings - Karcher K7 Premium Full Control Plus complete with T450 with £50 cashback NEW!!! Condition is New. 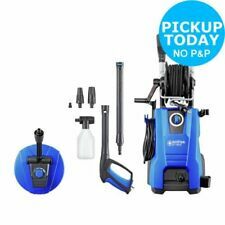 Other convenient features include onboard storage for all your accessories, as well a reel for the 8m high-pressure hose, a stability foot at the base of the pressure washer and a second carrying handle. 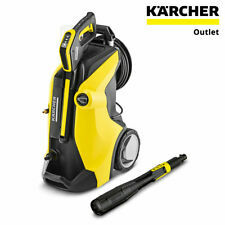 New Karcher K5 Premium Full Control Home Pressure Washer. The 3-in-1 Multi Jet spray lance enables different spray types simply by turning the spray lance. 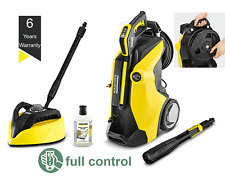 Includes 5 years warranty 1 Year EXTRA Warranty when you buy from Karcher Center Craigmore. Quick, easy and convenient application of detergents with the pressure washer. 3000W Water-cooled motor. There's also an 10m high pressure hose to give you plenty of reach, and a state-of-the-art long-life water-cooled motor. Product Contents: T450 Patio Cleaner, 1 L 3-in-1 Stone and Facade Detergent, Car kit, Rotating washing brush, Foam jet 0.3 l, Car shampoo 3-in-1, Drying cloth, 1 l, High-pressure gun, Vario Power spray lance, Dirt Blaster, Adapter garden hose 3/4". The state-of-the-art water-cooled motor gives extra durability and outstanding performance. Robust and high-quality it is steel reinforced for durability. The extension hose can endure up to 160 bar pressure and temperatures up to 80°C. There's also a 10m high pressure hose to give you plenty of reach, and a state-of-the-art long-life water-cooled motor that gives extra durability and outstanding performance, backed by the Kärcher 5 year warranty. Also uses iconography showing where each of the 4 pre-defined settings should be used. Includes the Patio Cleaning Kit which is ideal for larger cleaning tasks such as decking, block paving and stone patios. The trigger gun guides the user using an LED display that clearly shows which pressure setting should be used where. Simply push the /- buttons on the high pressure gun to change the pressure or detergent settings to suit the area being cleaned. The state-of-the-art water-cooled motor gives extra durability and outstanding performance. Made of high-quality aluminium. For quick, convenient and comfortable application of detergents with the pressure washer. Promotion valid from May 15 to July 15, 2015. For info and regulation go on kaercher-cashback. KEY FEATURES: Max Pressure: 145bar - Max Capacity: 500l / h - Power 2100W - Weight: 12,8Kg. 2nd carrier handle, 8m high-pressure hose on hose reel. 1 m, retractable for optimal storage and stability foot incl. Hose guidance through unit: better handling and increased stability. Rotating this lance enables the user to select between vario lance, dirt blaster and detergent setttings. For detergent application, the pressure washer uses a Plug & Clean system which enables direct connection of cleaning detergents such as the supplied Stone & Facade cleaner. If you are looking for a high pressure washer capable of cleaning: patio's, decking, facades, Bikes, caravans, garage doors, look no further. The trigger gun guides the user using an L.E.D. Display and shows which pressure setting should be used where. The inclusion of a T450 patio cleaner enables the operator to clean large surface areas like driveways or patios without spraying water and debris over the surrounding area, and a bottle of stone & facade cleaner provides extra dirt removal with a protective formula to keep stone surfaces cleaner for longer. Also uses iconography showing where each of the 4 pre-defined settings should be used. 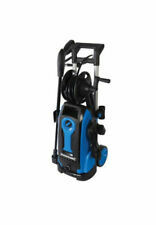 With a hose reel on the back of the unit, this makes winding and unwinding your high-pressure hose even easier. 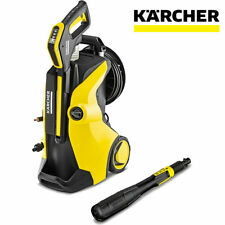 Karcher Part no: 1.324-635.0. Also uses iconography showing where each of the 4 pre-defined settings should be used. With a hose reel on the back of the unit, this makes winding and unwinding your high-pressure hose even easier. Check the 2nd and 3rd picture taken from actual item. The trigger gun guides the user using an L.E.D. Display and shows which pressure setting should be used where. You can change the pressure setting on the device at the push of a button. Simple push the /- buttons on the high pressure gun to change the pressure or detergent settings to suit the area being cleaned. Quick Connect on machine. There's also an 10m high pressure hose to give you plenty of reach, and a state-of-the-art long-life water-cooled motor that gives extra durability and outstanding performance, backed by theKärcher 5 year warranty. The 13246350 features a powerful 2100 Watt motor that produces 145 bar pressure to amplify the water pressure, providing the power necessary for cleaning a variety of applications. You also get the Karcher 3-in-1 Multi Jet Spray lance that provides jet streams ranging from flat stream, rotor and detergent nozzle as well as application icons to indicate each nozzle. Also uses iconography showing where each of the 4 pre-defined settings should be used. 1 x Vario Power Spray Lance. 1 x Dirt Blaster Spray Lance. Includes the Patio Cleaning Kit which is ideal for larger cleaning tasks such as decking, block paving and stone patios. Impact Drivers & Wrenches. Space Heaters. Multi Function Tools. Max Water Feed Temperature: 60°C. Power Tool Kits. Site Lights & Cable Reels. Workwear, PPI & Safety. Safety Boots. Impact Drivers & Wrenches. Space Heaters. Multi Function Tools. Max Water Feed Temperature: 40°C. Power Tool Kits. Site Lights & Cable Reels. Workwear, PPI & Safety. Safety Boots.